This section explores the events leading up to the war. 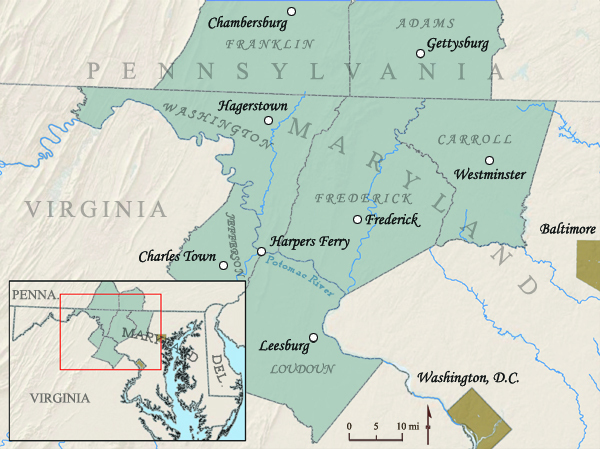 John Brown launched his raid on Harpers Ferry, Abraham Lincoln was elected president, and the border state of Maryland wrestled with its loyalties. Union and Confederate armies both tried to gain control of this important border region. Read about the military activity here, and about the major engagements at Antietam, Gettysburg, and Monocacy. The life of civilians changed dramatically because of the war. Churches became hospitals, property was destroyed or confiscated, and military regulations intensified the tensions. Discover the ways that civilians on the homefront experienced and contributed to the war effort. African Americans made momentous decisions in their quest to be free. Explore the way the war affected them and the choices they made, including enlisting in the Union army. Officials from both the US and Confederate governments violated the civil liberties of civilians in order to advance their war efforts. Consider the arrests of civilians, the suspensions of habeas corpus, and the banishment of some individuals and families considered to be disloyal. Women and children encountered the war in their own way as they participated behind the lines and on the lines, and made tremendous sacrifices. Read about the hardships they endured and about the ways they supported the soldiers. After the war, mid-Marylanders struggled to reintegrate into their communities returning veterans from both sides of the war. The role of African Americans was contested as they became free enfranchised citizens with the 13th, 14th, and 15th amendments. Efforts to remember those who participated in the war stirred controversy along with commemoration. Cemeteries were filled with soldiers who fell here, but sometimes only one side was welcome. Preserving battlefields and holding reunions were other ways of honoring veterans.